Bob Dob is the patron artist of everyone who will probably have Social Distortion playing at their wedding, assorted birthdays and their funeral. 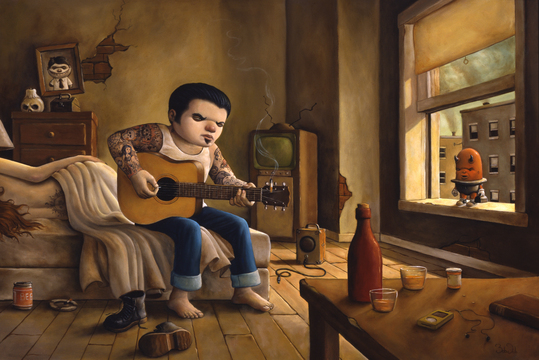 His colorful portraits of diminutive punk rockers, meanie mouseketeers, and pill, pot, cheese, paper bag and amp headed everymen, are instantly captivating, especially for those of us who can’t get through Ball and Chain without getting a little choked up. The Hermosa Beach native grew up in an area with plenty of punk rock graft and glory to be inspired by, and his craft, honed at the Otis College of Art and Desgin, is detailed and intricate without sacrificing warmth and feeling. It feels like every portrait was done at sundown after a long day, or at sun up after a long night. Check out his website for more information and imagine how great one of his pieces would look above your JCM 800. Tell him PunkGuru.com sent you.